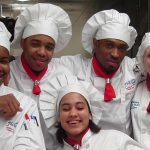 Culinary Skills 3-4: This course is designed for motivated students pursuing a career in the field of culinary arts. 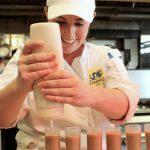 Students utilize commercial equipment to learn advanced skills of food handling and preparations. 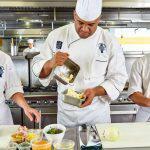 Students apply knife skills, appropriate cooking methods, as well as kitchen safety and sanitation as it relates to the food industry. 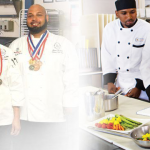 Culinary Skills 5-6: This advanced course is designed for students pursuing a career in the field of culinary and pastry arts. Students apply fundamental baking skills in the preparation of yeast breads, quick breads, laminated dough, cookies, pies, pastries, cakes custards, creams, and sauces.